She laid in bed with the blanket pulled up to her ears. She was curled up on her side like a cat. She knew she laid like a cat because her cat Barty was beside her and laid in quite a similar position, his gray paws stretched out toward her face. They smelled the waft of chocolate at the same moment too. Barty’s nose twitched and his eyes opened slowly to settle on hers. To say that outside, the wind was howling would be quite the understatement. Emily-Anne had purchased the flat on Water Street for the romance of it; the way the little apartment seemed to sit on top of the square brick building made it look like an unwieldy tower, like something Seuss would’ve created. She had walked through the front door with Mr. Chastof, the realtor, and had fallen in love with the crooked floor and the slanted ceiling and the round windows. She felt a bit like she had found a bizarre little outpost on the very top of the world. But she was not prepared for how precarious she would feel in her little suite of rooms when a storm would come off the seaport and the wind would whip upwards. The first few times the wind had made its assault, the windows shook in their narrow frames and Emily-Anne’s heart hammered along in time. But it had been months now, months of summer storms and dark skies, and she no longer felt that skitter of fear when the wind howled and the floor seemed to buckle beneath her feet. She laid in her bed and listened to it descent on her roof, on the walls. Forget February. Chocolate and September feel like they’re made for each other. Why? I don’t know. I suppose it has something to do with the sudden drop in temperature. Or the way the light is disappearing earlier and earlier. Work has picked up. School is back. There’s a flip side to the beauty of Fall and as much as I deeply love this month and the next, sometimes you wake up in September and the only thing that’ll get you up and out of bed (it’s still dark?) 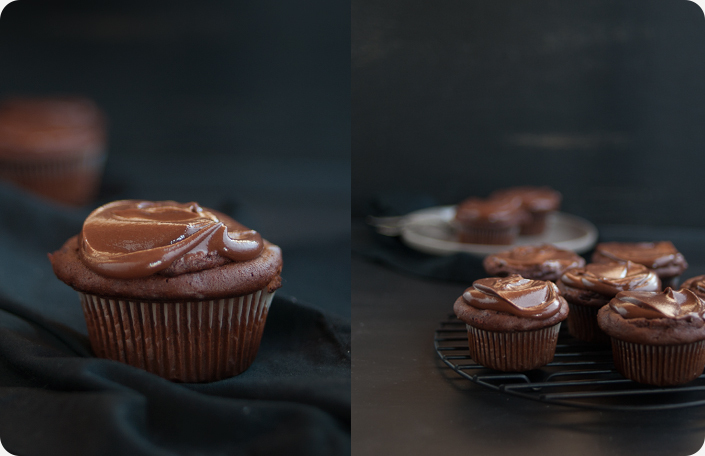 is the promise of eating a brownie… that’s hidden in a cupcake… and covered in frosting… at the end of the day. Warm, dark, gooey, chocolate. Overnight alert! 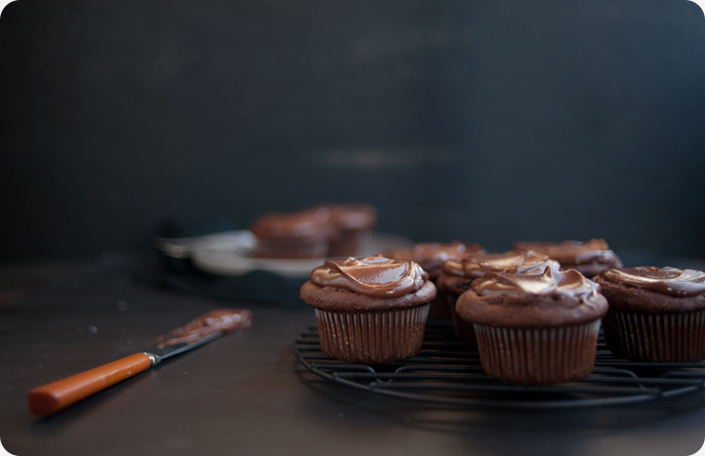 | Source: kevinandamanda.com | Makes 36 cupcakes | Print Recipe | If you like this recipe, you’ll love The Chocolate Mug of Sadness. Combine all ingredients in a large bowl and mix on medium speed for 2 mins until well combined. Using a small scoop (about 1 and 1/2 tablespoons), drop batter onto a baking sheet lined with parchment paper and freeze overnight. 2. The next day, make the cupcakes. Preheat oven to 325 degrees. Spray a muffin tin with cooking spray and line with cupcake liners. Combine all ingredients except chocolate chips into a very large bowl and mix on medium speed for 2 minutes until the mixture is well combined. Using a large scoop (about 3 tablespoons) drop batter into the cupcake liners, filling about 2/3rds full. Remove brownie batter from freezer and press into the cupcake batter. Bake for 22-28 mins. Allow to cool completely before frosting. Note: These are dense, squat cupcakes. The heaviness of the brownie batter may cause them to collapse a bit but they’ll still be delicious, don’t worry. 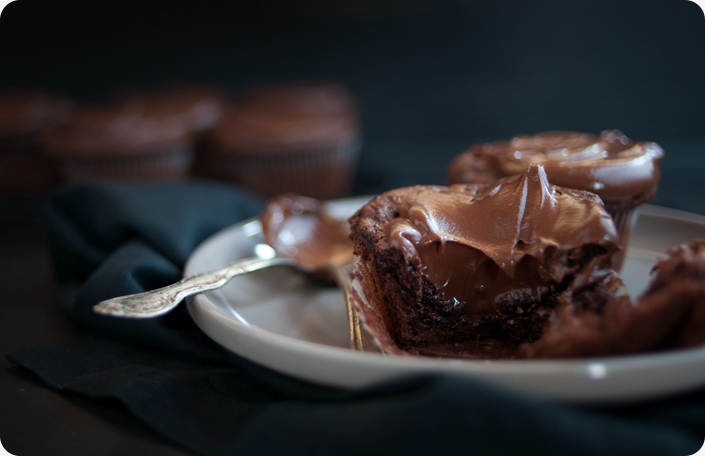 These are the brownie hobbits of the cupcake world. Melt chocolate chips in the microwave, stirring well every 30 seconds. Allow to cool for 5-10 mins. Combine butter, sugar, cocoa and salt in a food processor and process until smooth, about 30 seconds. Scrape the bowl as needed. Add the corn syrup and vanilla and process until just combined, about 5-10 seconds. Scrape the bowl again, then add the melted chocolate and pulse until smooth and creamy, about 10-15 seconds. Note: If you don’t have a food processor, you can use a mixture but take care not to whip the butter too much. Frosting recipe adapted from Cook’s Illustrated. You gals marry my two favorite things: food and stories. This is the BEST blog ever. Truly!